Marcus Samuel Blitzstein (March 2, 1905 – January 22, 1964), was an American composer, lyricist, and librettist. He won national attention in 1937 when his pro-union musical The Cradle Will Rock, directed by Orson Welles, was shut down by the Works Progress Administration. He is known for The Cradle Will Rock and for his Off-Broadway translation/adaptation of The Threepenny Opera by Bertolt Brecht and Kurt Weill. His works also include the opera Regina, an adaptation of Lillian Hellman's play The Little Foxes; the Broadway musical Juno, based on Seán O'Casey's play Juno and the Paycock; and No for an Answer. He completed translation/adaptations of Brecht's and Weill's musical play Rise and Fall of the City of Mahagonny and of Brecht's play Mother Courage and Her Children with music by Paul Dessau. 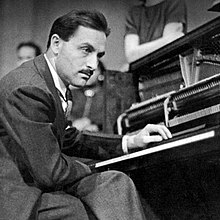 Blitzstein also composed music for films, such as Surf and Seaweed (1931) and The Spanish Earth (1937), and he contributed two songs to the original 1960 production of Hellman's play Toys in the Attic. Blitzstein was born in Philadelphia on March 2, 1905, to affluent parents. Blitzstein's musical gifts were apparent at an early age; he had performed a Mozart piano concerto by the time he was seven. He went on to study piano with Alexander Siloti (a pupil of Tchaikovsky and Liszt), and made his professional concerto debut with the Philadelphia Orchestra in Liszt's E-flat Piano Concerto when he was 21. The dramatic premiere of the pro-union The Cradle Will Rock took place at the Venice Theater on June 16, 1937. 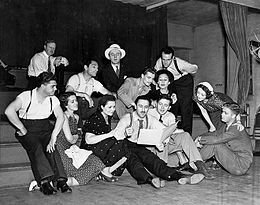 The cast had been locked out of the Maxine Elliott Theatre by the Works Progress Administration, the government agency which had originally funded the production, so the cast and musicians walked with the audience to the nearby Venice. There, without costumes or sets, they performed the work concert-style, actors and musicians alike, sitting among the audience (to evade union restrictions on their performance) with Blitzstein narrating from the piano. In 1939, Leonard Bernstein led a revival of the play at Harvard, narrating from the piano just as Blitzstein had done. Blitzstein attended the performance, after which he and Bernstein became close friends; Bernstein would later say that Blitzstein's contribution to the American musical theatre was "incalculable". The 1999 film Cradle Will Rock was based on this event, though heavily embellished. In the film, Blitzstein (played by Hank Azaria) is portrayed as gaining inspiration through ghostly appearances by his idol Brecht and his late anorexic wife. Additional major compositions include the autobiographical radio song play I've Got the Tune, The Airborne Symphony (1946), Regina (1949), Reuben, Reuben (1955), and Juno (1959). At the time of his death Blitzstein was at work on Idiots First, a one-act opera based on the eponymous story by Bernard Malamud – intended to be part of a set of one-acters called Tales of Malamud – which Ned Rorem has called "his best work". This was followed by the work Blitzstein intended to be his magnum opus, a three-act opera commissioned by the Ford Foundation and optioned by the Metropolitan Opera entitled Sacco and Vanzetti. Both Tales of Malamud and Sacco and Vanzetti were completed posthumously, with the approval of Blitzstein's estate, by composer Leonard Lehrman. Lehrman's long-awaited Marc Blitzstein: A Bio-Bibliography, published in 2005 by Praeger, is the longest published biographical bibliography of any American composer at 645 pages. During a visit to Martinique in 1964, at the age of 58, Blitzstein was murdered by three sailors he had picked up in a bar, one of whom he was said to have propositioned. He is buried at Chelton Hills Cemetery in Philadelphia. Blitzstein was openly gay. He wrote to his sister in 1929, regarding prior attempts to suppress or hide his orientation, "it is absurd to assume there are no sins; there are definitely Cardinal sins -- sins against oneself, against one's law. My sin is, has been... the willingness to corrupt my nature." His first lover was the conductor Alexander Smallens, with whom he traveled to Europe in 1924. Blitzstein nevertheless married novelist Eva Goldbeck on March 2, 1933. They had no children. His mother-in-law was Berlin-born musical star and opera singer Lina Abarbanell. He dedicated a number of works, including Romantic Piece for Orchestra (1930), String Quartet, 'The Italian' (1930), the ballet Cain (1930), and the Serenade for String Quartet (1932) to his wife-to-be. She died of anorexia in 1936, and his grief prompted him to throw himself into the work of creating The Cradle Will Rock. Toys in the Attic (1960) — play — featured songwriter for "French Lessons in Songs" and "Bernier Day"
^ Marc Blitzstein Papers, Wisconsin Historical Society, retrieved 12 January 2014. ^ a b Pollack, Howard (2012). Marc Blitzstein: His Life, His Work, His World. Oxford University Press. 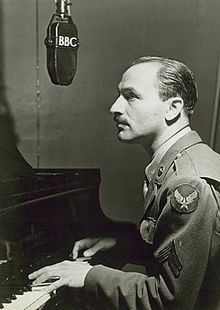 ^ "Marc Blitzstein — www.greenwood.com". Greenwood.com. 2005-09-30. doi:10.1336/0313300275. Retrieved 2010-03-29. ^ Jansson, John (2001). "Marc Blitzstein: a brief biography 1958-1964", marcblitzstein.com; accessed June 8, 2017. ^ a b Shewey, Don (July 16, 1989). "'Moonlight' and Marxism". The New York Times Book Review. ^ Wilson, Scott. Resting Places: The Burial Sites of More Than 14,000 Famous Persons, 3d ed. : 2 (Kindle Locations 4244-4245). McFarland & Company, Inc. Kindle Edition. ^ Encyclopedia of American Jewish history, volume 2. ABC-CLIO. 2007. p. 691. Wikimedia Commons has media related to Marc Blitzstein.